Atlantic mackerel (carapau) is by far the most popular variety of mackerel in Portugal. Its close cousin, the common mackerel (cavala) has been on the sidelines of Portuguese cooking for a number of years but is now enjoying a well deserved revival. Its health benefits together with unique taste and texture make this a prime choice for a fish meal. 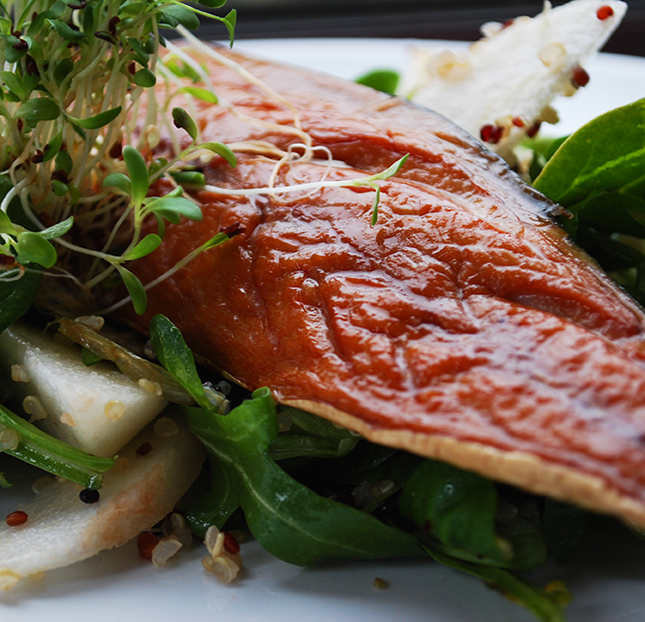 This recipe combines the strong taste of smoked mackerel with the sweetness of Rocha pears – the uniquely Portuguese pear variety created by the Rocha family in 1836 in Sintra. 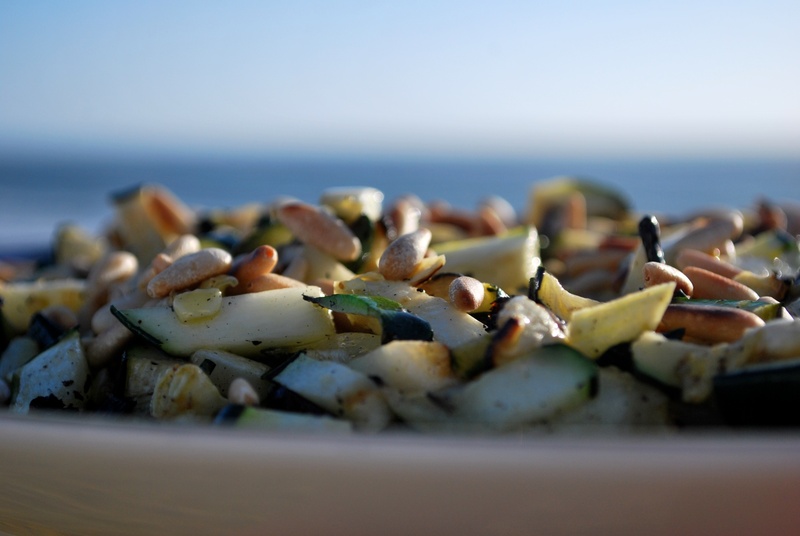 Courgettes are a relatively recent addition to the Portuguese pantry . This salad turns this rather bland vegetable into a flavourful dish with with the help of a bbq, good quality olive oil, garlic and parsley. This is a great salad to accompany grilled meat or fish and can be served hot or cold. This is an excellent way of using the heat from the a nice charcoal barbecue to lend a smokey flavour and crispy texture to fresh squid. 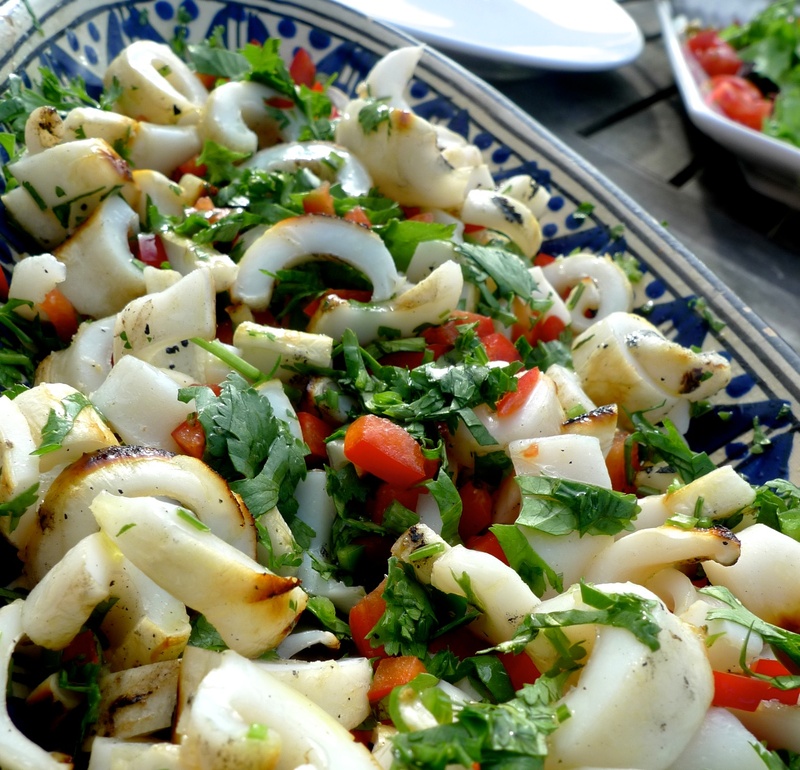 This recipe is a mix between grilled squid, commonly served in skewers (espetada de lulas) and octopus salad (salada de polvo). Now in season and pretty easy to find in forests and shady locations, wild garlic makes for an excellent addition to the normal herb repertoire. The leaves can be finely chopped and added to an omelette while the flours add great looks and taste to a salad. 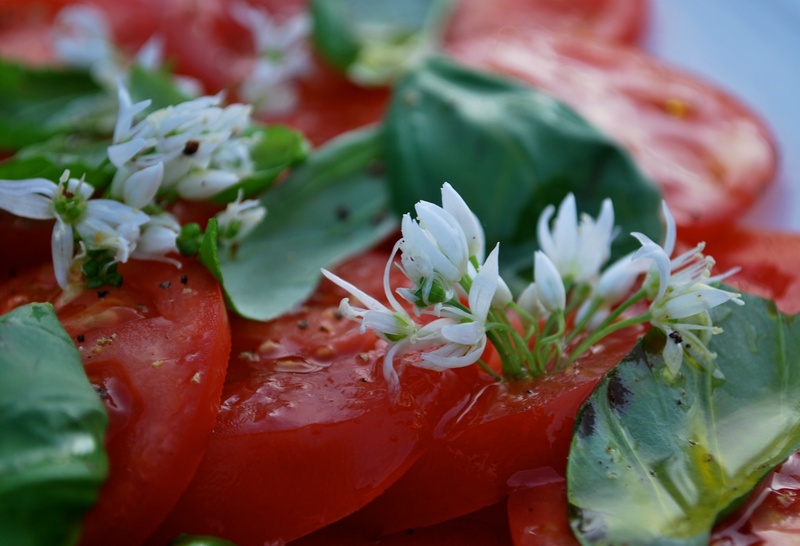 Pictured is a simple tomato and basil salad, dressed with fleur du sel, freshly ground pepper and olive oil, garnished with a few wild garlic flowers! A pepper salad made out of chargrilled green peppers is the traditional accompaniment to grilled sardines in Portugal. This is a simple version with a potentially relevant trick – wrap the peppers in cling film for 5-10 minutes after grilling to make pealing easier. A light salad that can be served hot or cold as an accompaniment to fish (see salted cod ceviche) or grilled meat. A little different from the Portuguese traditional… the smoked fat gives the dish a nice rich taste.